When will they fix this bug? I'm not still able to level up and gain points past Grandmaster level, it's being frustrating! I Hope they fix it Soon! I have been having the same issue here and can offer some of the details being requested to troubleshoot. Firstly, this is absolutely a base game issue. I have reproduced the issue with a freshly repaired install using no mods on a brand new sim using cheat codes and even cheat codes refuse to provide additional points past grandmaster. It is extremely easy to reproduce as it is absolutely 100% consistent in its behaviour. I was levelling past grandmaster fine before the patch, then took a break from my normal game while the aging bug was resolved and now that I have returned to my main save I am unable to progress further. So its not one of those things where features behave wacky on out of focus households. As an indication that it did work previously, my existing vamp from pre-patch has roughly 88 power points currently. However when I did the test with a brand new sim I could only get it to a maximum of 48 points. I have the same issue. after the get famous pre patch my grandmaster vampire who already had 146 extra points stopped gaining points. his bar is stuck full purple. I tried with a fresh vampire and again the same issue. no point gain after hitting grandmaster but has a full purple exp bar. I have not bought the get famous expansion yet. After the Get Famous patch, I haven't been able to get Grand Master vampires to earn additional perk points. The bar will fill up, but it won't reset and give perk points. it's a known issue. I merged your post. EA hardly ever gives ETAs on fixes, so guess all you can do is wait for the next patch. Don't think any workaround has been found either. At least not to my knowledge. I just encountered this when I was cheating my vampire rank up past grandmaster; it wouldn't let you accrue more points even with cheats! Steps: How can we find the bug ourselves? Create a vampire, max out vampire rank, use cheat stats.set_stat rankedStatistic_Occult_VampireXP 1593 Vampire gains 2 vampire points the first use but the next uses of the same cheat do not grant vampire points. This is not about the vampire energy bar! What happens when the bug occurs? The vampire rank bar just fills but no vampire points are granted or can even be earned. Since no points are granted the bar stays at 100%. The cheat to reach a lower vampire rank has to be used to empty the vampire bar but when its full the sim does not gain 2 vampire points. What do you expect to see? I expect the vampire to gain 2 vampire points every time I use the cheat. Please describe the patch or change you made. It was either with the latest sims 4 patch on 20th november or the patch on 13th november. Some of my sims cant gain any vampire points due to this bug. Its especially frustrating with new vampires when I need extra points. 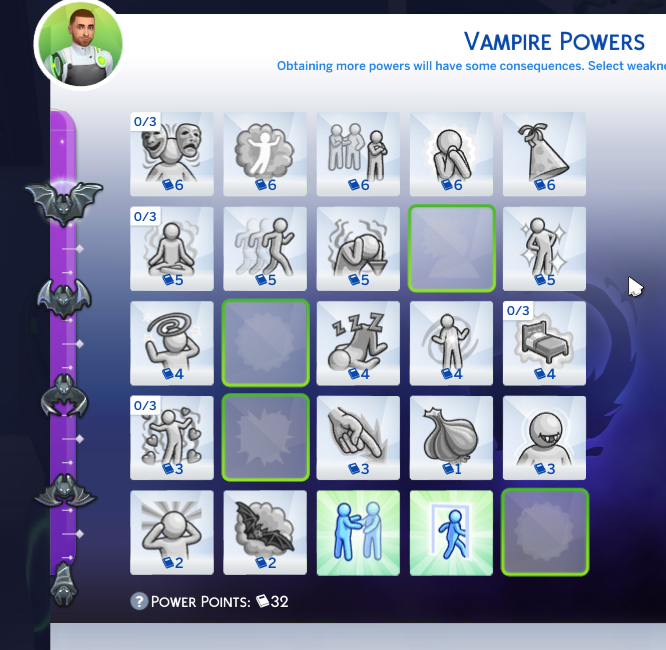 My older vampires with all powers unlocked or extra points dont suffer. But even with them the cheats result in a full bar but no points.